From January through September 2016, a team of NOAA and external partners will embark on a journey with NOAA Ship Okeanos Explorer to investigate and document deep-water environments in and around the Hawaiian Archipelago, the Commonwealth of the Northern Marianas Islands (CNMI) and the Marianas Trench Marine National Monument (MTMNM), and Wake Atoll section of the Pacific Remote Islands Marine National Monument (PRIMNM). A multidisciplinary team of scientists, technicians, and engineers – both on board the ship and on shore – will conduct undersea mapping and remotely operated vehicle (ROV) explorations of the geological, biological, archaeological, and chemical features of these vast areas. The 2016 field season marks the second year of the Campaign to Address Pacific monument Science, Technology, and Ocean NEeds (CAPSTONE). CAPSTONE focuses on systematically collecting baseline information to support science and management needs within and around the U.S. Marine National Monuments and other protected places in the Pacific. It also serves as an opportunity for NOAA and the Nation to highlight the uniqueness and importance of these national symbols of ocean conservation. Throughout the year, telepresence technology will allow you to follow discoveries via the NOAA Office of Ocean Exploration and Research website, putting the unexplored ocean directly into your hands. NOAA is interested in identifying scientists and managers interested in actively participating during some or all of the 2016 expeditions. For details on opportunities to get involved, please visit this page. If you are interested in providing input into expedition planning or participating as a scientist or student, please contact CAPSTONE Science Advisor, Dr. Christopher Kelley. The yellow box indicates the operating area for the project. The red lines show the approximate location of the U.S. EEZ boundaries. Image courtesy of the NOAA Office of Ocean Exploration and Research. Download image (jpg, 86 KB). The first two cruises of the Okeanos Explorer 2016 field season will be dedicated to thoroughly testing, troubleshooting, and calibrating all essential science equipment on the ship. This work is essential following the extensive ship repair and maintenance work completed in drydock over the winter. In addition, the ship has a great deal of new scientific equipment and electronics that must be set up, configured, and tested prior to being relied upon during explorations for the rest of the year. This work is called a ship “shakedown” and is essential in ensuring the ship is fully ready for the field season and will collect the highest quality data possible. The first cruise will take the ship from San Francisco, California, to Honolulu, Hawaii. This is a mapping shakedown cruise, and the primary goals of the cruise include: exploratory ocean mapping; shakedown, testing, and calibration of existing and newly installed equipment; and positioning the ship for the 2016 exploration missions in the central and western Pacific Ocean. New equipment in need of shakedown testing includes a new Very Small Aperture Terminal (VSAT) antenna, a new Keyboard-Video-Monitor (KVM) system, new Doppler speed log, a new POS-MV inertial motion and positioning system, four new EK60 split-beam sonars, two new Acoustic Doppler Current Profilers (ADCPs), new digital file storage systems, and a newly installed UnderwayCTD. A multibeam “patch test” calibration will also conducted during this expedition to ensure that the seafloor measurements collected on the ship are accurate. Once in Hawaii, the team will conduct a second cruise to continue to shakedown the newly installed systems, test data work flow and integration, and prepare for the rest of the field season. A primary objective of the cruise is to test the ROVs in a controlled environment and train new ROV engineers. Twenty-four-hour ROV and mapping operations will be conducted, with a primary focus on completing engineering priorities and testing new systems. Exact locations of discrete ROV dives and mapping activities will be determined during the cruise, as results of engineering and shakedown tests are evaluated and once weather and operational constraints are factored in. Scientists imaged this squat lobster on an undescribed genus of bamboo coral (family Isididae) during the 2015 Hohonu Moana Expedition. This new genus of coral was first discovered in 2007 off of Twin Banks in the Northwest Hawaiian Islands/Papahānaumokuākea Marine National Monument. Image courtesy of the NOAA Office of Ocean Exploration and Research, 2015 Hohonu Moana. Download image (jpg, 86 KB). This cruise will continue the 2015 Hohonu Moana Expedition’s exploration of deep-water habitats in and around Papahānaumokuākea Marine National Monument (PMNM) and will include work on seamounts in the Mid-Pacific Mountains while en route to port in Kwajalein. Daily ROV dives are planned as we transit to our focus of operations in the northwestern portion of the PMNM. Seamounts, rift zone ridges, and other types of abrupt topography will be targeted due to their likelihood of hosting extensive communities of deep water corals and sponges, as well as likely manganese crust habitats from 1,000-2,500 meters. Limited work is also planned at a potential underwater cultural heritage site. The expedition will be designed to complement previous work in the region, including work done during the Schmidt Ocean Institute’s 2014 R/V Falkor mapping expedition and previous work by the U.S. Geological Survey, University of Hawaii’s School of Ocean and Earth Science Technology (SOEST) and their deep submergence facility, Hawaii Undersea Research Laboratory (HURL), and NOAA’s Pacific Islands Benthic Habitat Mapping Center. 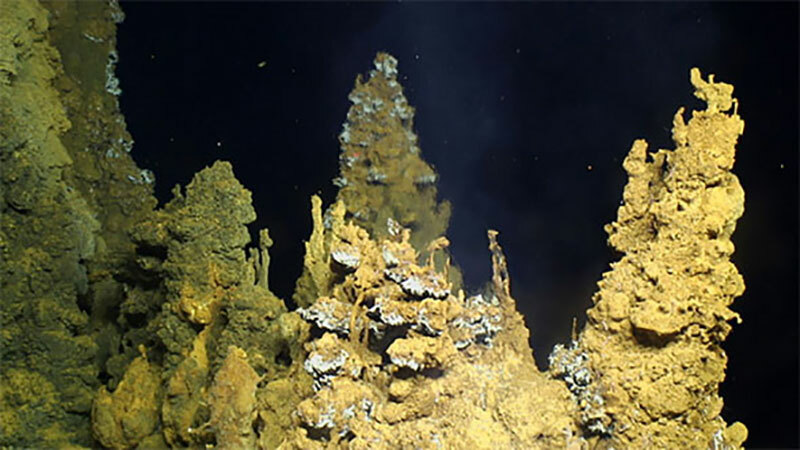 Sulfide chimneys coated with iron-based microbial mat at the Urashima Vent are investigated by the Submarine Ring of Fire 2014 – Ironman expedition team using ROV Jason. 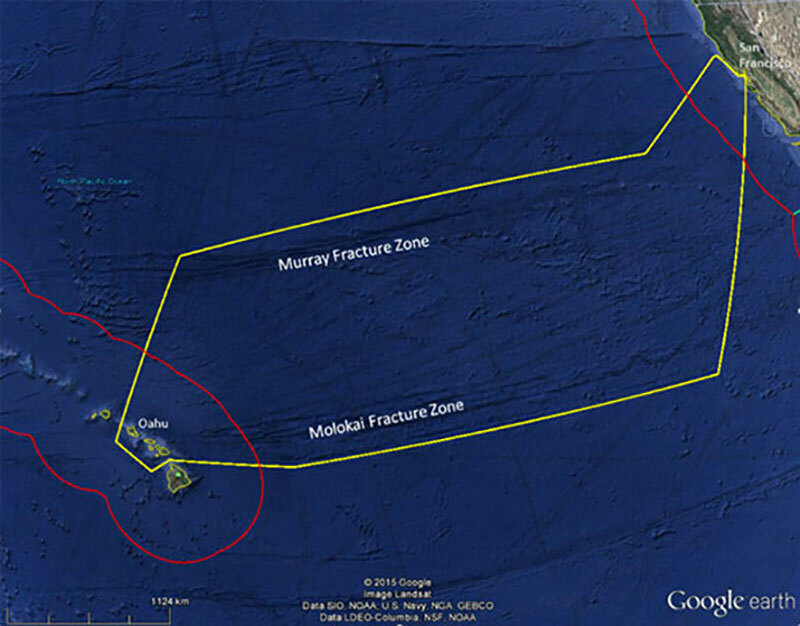 Image courtesy of Submarine Ring of Fire 2014 - Ironman, NSF/NOAA, Jason, Copyright WHOI. Download image (jpg, 87 KB). During this series of cruises, Okeanos Explorer will focus on the diversity and distribution of deepwater habitats in the Commonwealth of the Northern Marianas Islands (CNMI) and Marianas Trench Marine National Monument (MTMNM). Operations are expected to include work at hydrothermal vent sites, mud volcanoes, trench/subduction zone areas, seamounts, and sites of interest to fisheries, including deep-sea coral and bottom fish habitats. Operations are being designed to complement previous and planned field work in the area, including by NOAA Pacific Marine Environmental Laboratory’s Earth-Ocean Interactions Program, the U.S. Extended Continental Shelf Project, and Schmidt Ocean Institute’s R/V Falkor expeditions . 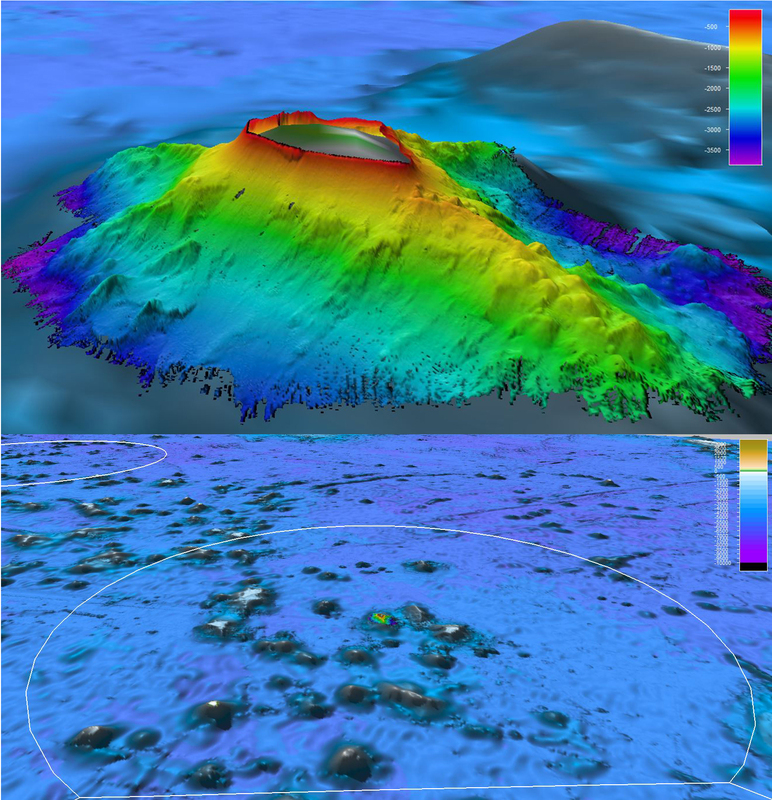 Images showing high-resolution bathymetry data surrounding Wake Island collected in 2007 by NOAA Ships Ahi and Hi'ialakai during cruises AHI-07-01 and HI-07-01. The lower image shows publicly available high-resolution bathymetry acquired using sonars, overlaid on satellite-derived bathymetry. The white line is the boundary of the U.S. Exclusive Economic Zone and Wake Island part of the Pacific Remote Islands Marine National Monument. 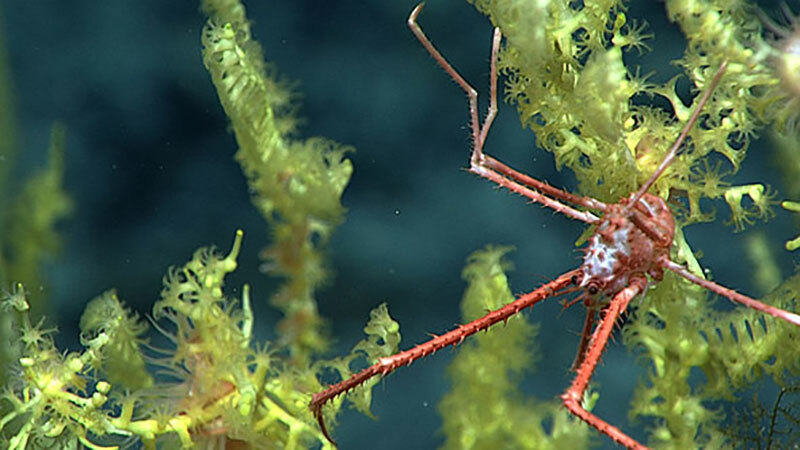 The 2016 series of Okeanos Explorer cruises will focus on collecting high-resolution undersea mapping data and imagery of unknown and poorly known deepwater areas within the Monument. Aside from a few transit mapping lines, the data shown around Wake appears to be the only publicly available data in the entire surrounding U.S. EEZ. Depth color bars in both images are in meters. Image courtesy of the NOAA Office of Ocean Exploration and Research, 2015 Hohonu Moana. Download larger version (jpg, 1.6 MB). During this series of cruises, the expedition team will focus on investigating the diversity and distribution of habitats in and around the Wake Island section of the Pacific Remote Islands Marine National Monument (PRIMNM). Mapping operations and ROV dives are planned to focus on seamounts and searching for potential underwater cultural heritage sites associated with the World War II Battle of Wake Island. These investigations will include the first look at deep-water habitats and seamounts within the recently expanded Wake Island section of the PRIMNM.